While traveling in Japan it is essential to try the local cuisine. Nagano is famous for soba, Nozawana (a pickled leafy green), basashi (horse sashimi), some insect dishes like inago (grasshoppers) and hachinoko (bee larva), and my favorite oyaki. Oyaki are stuffed dumplings. The dough can be made from flour or buckwheat. It is stuffed with a variety of ingredients like mushrooms, kabocha squash, kiriboshi daikon (dried daikon strips), eggplant, walnuts, azuki sweet red beans, or my favorite, the local pickle Nozawana – a leafy green (photo above left). We bought these handmade oyaki at a local supermarket. At home we fry them up in a pan with a little bit of oil. A great snack or side dish to a meal. There are a handful of Japanese cheese producers that I am a big fan of and one of them is Nagato from Nagano. It’s on the top of the mountains, the air is clean and crisp and there are cows. For this Minnesota girl, it was like visiting a friend’s home growing up, but with cheese, and a big selection to choose from. And, the area is filled with birch trees (shirakaba), another nice nod to home. There is the farm, a retail shop, and a restaurant. My favorite is the tezukuri gouda miso cheese. Cubes of gouda cheese mixed with Shinshu miso. We love this with wine or saké. There is also ice cream, yogurt, and milk. The restaurant serves pizza, cheese and sausage plates, curry, and cheesecake. In Suwa, Nagano we came across this lovely Marutaka Miso shop. The shop celebrates its 100th anniversary for making miso since 1916. The area is famous for Shinshu miso, made from soybeans and rice. There is also a kome kōji miso, made with extra kōji (aspergillus oryzae) that is aged for a longer time resulting in a sweet and mild miso. Marutaka also has many other pantry staples including soy sauce, vinegar, sake, and more. It’s a fun shop to visit and there are plenty of products to bring home for yourself and for omiyage for friends. One of the miso we brought home is this miso mixed simply with green chili peppers. A spicy dip for crudite of daikon, cucumbers, and carrots. We don’t think of heat in the Japanese palate, so this is a fun way to add spice to your table. closed Monday. If Monday is a national holiday, it is open and then closed Tuesday. When deciding where to stay while traveling in Japan there are many considerations for type of stay. When we can, we try to stay at local ryokan inns with onsen hot springs. Nunohan was put on my radar by a friend who lives in Suwa, Nagano. We loved it. The ryokan is kid-friendly, had lovely cuisine, and my requirement for any stay a rotenburo, outdoor onsen. For dinner we included a flight of local saké with the full course kaiseki. Breakfast (photo on left) included freshly made tofu, grilled salmon, and much more. The rotenburo and onsen was big and spacious. Nunohan is on the banks of Lake Suwa. Here is the view from our room. We loved taking a walk on the lake, kind of reminded me of being back in Minneapolis, but this lake is much bigger than the ones in the Cities and here we have mountains. Nunohan has been in operation for 160 years. A short trip from Tokyo is Suwa in Nagano. The city of about 50,000 people sits on the shore of lake Suwa and has mountains nearby. We love coming here as it is one train from Tokyo, as the air is refreshing, and Nagano is known for good sake and food, particularly soba. We are big fans of Masumi sake, which has a lovely tasting room in Suwa. Nearby are four other sake breweries with tasting rooms worth visiting. You can make an afternoon of tasting and exploring sake. Then spend the rest of the day soaking in an onsen hot spring and dining in a ryokan. Here are the five breweries, all within a few minutes of each other, and walking distance from the city center. While in Suwa in Nagano we happened upon this local soba-ya near Suwa station. The noren (curtain outside the shop) that said teuchi (handmade) soba caught our eye. Nagano is famous for growing soba buckwheat so we try and eat as much soba as we can while in Nagano. During our visit in spring there is also a lot of sansai (wild mountain vegetables) in the mountains. The shop owner hand-harvested the slightly bitter sansai that he fries up as tempura, a great partner for the earthy soba noodles. The shop is very casual. The walls are lined with autographed square cards from famous visitors. Service is friendly. Soba is also usually also a meal that is affordable, even if the noodles are made from scratch. Please confirm the hours of operation with the restaurant. No no Hana in Ohmachi is a quiet soba shop where the master makes the noodles from scratch. It is far from the station so a taxi would be needed if you don’t have a car. Here is the kamo seiro, soba with a duck and leek dipping sauce. The menu (Japanese only) was quite extensive and had many small dishes like homemade konnyaku with a mustard miso dressing, and vegetable tempura. 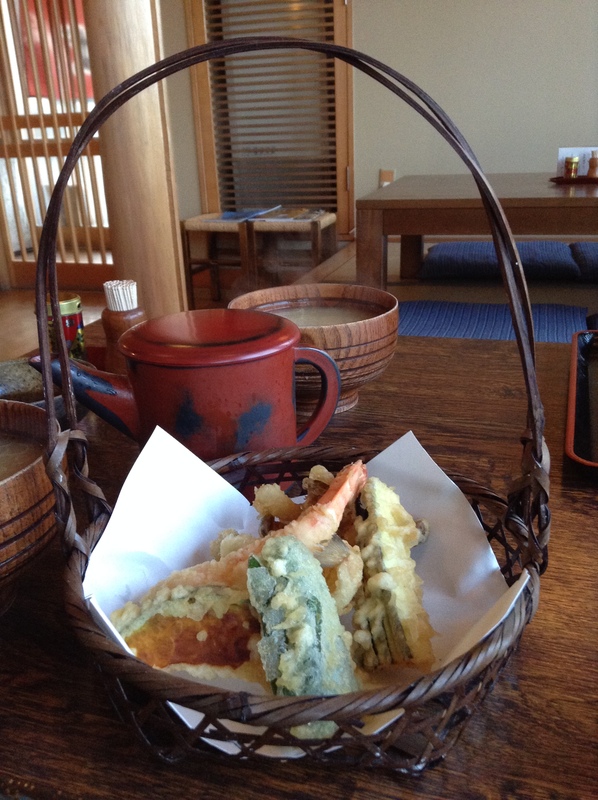 I love this beautiful presentation of the basket with the tempura on the folded paper. I was hoping to have sansai tempura, mountain vegetables, but it was still quite cold in this part of Nagano and the sansai season had yet to begin. We were told we were a few days away. This speaks to the master, who has a friend who harvests the vegetables from the wild. While the supermarket was selling sansai, it probably came from another part of Japan. Nagano is famous for soba, among many other things. But where to go, especially in the countryside? We asked around to friends about their recommendations, and a restaurateur told us about this lovely soba restaurant in Azumino called Okina. 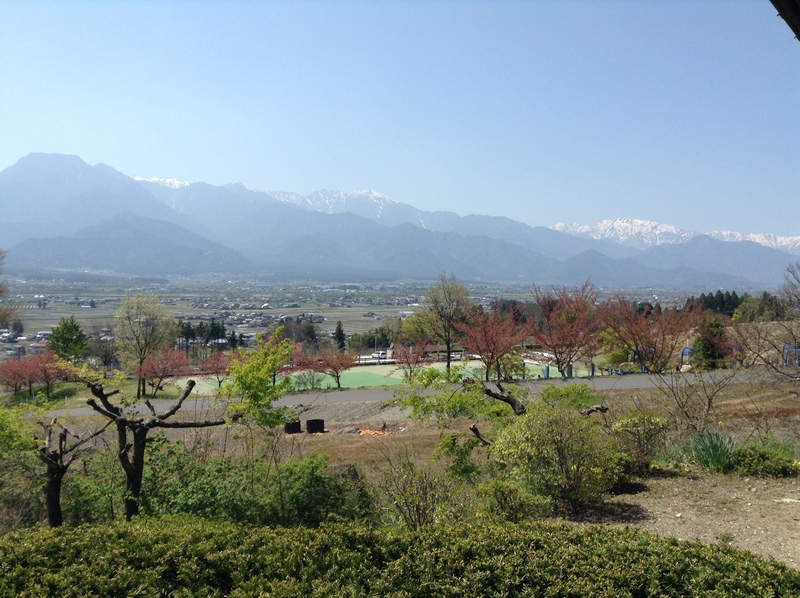 Azumino is a pastoral part of Nagano that has the impressive Kita Alps, Northern Japanese Alps, guarding it to one side. The menu was very simple, only four different soba dishes. No side dishes. At first I was disappointed, as I was hoping to linger over a few small dishes before the soba. But realized that a small menu is a good thing as turnover is very quick. There was always someone outside waiting to come in, and usually the wait was not too long, even on a sunny Sunday. This is the classic example of a shokunin, a craftsman who excels at doing one thing. 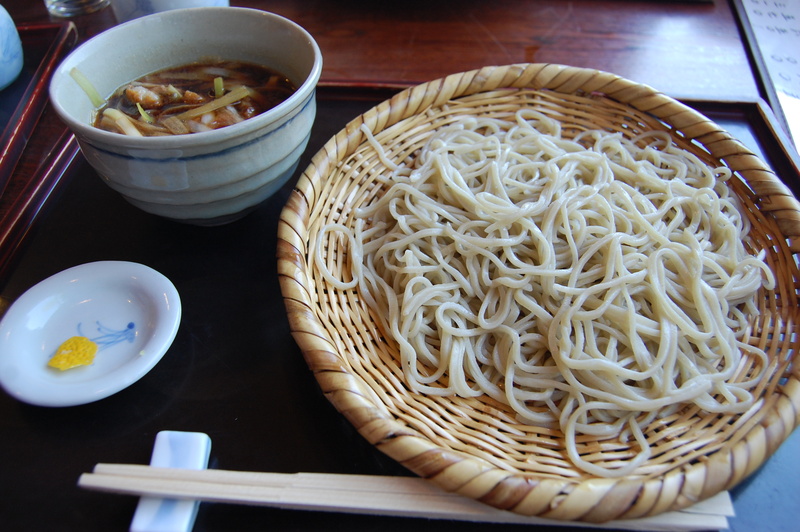 In this case, it is soba (buckwheat) noodles. The soba master, Wakatsuki-san, opened the shop at the age of 40 in 1997. Prior to that he was the manager at the Tokyo branch of the famous Hakone Akatsukian soba shop. Inside just as you walk in you can see his workshop for making soba noodles. I assume that he is there in the mornings and that he then moves over to the kitchen to cook during service. While there were waitresses, he did sometimes come out and help with the front of the house. Check out how simple the Azumino Okina menu is. The view was amazing. We had the Kita Alps as a backdrop. This is the view from the from the shop. 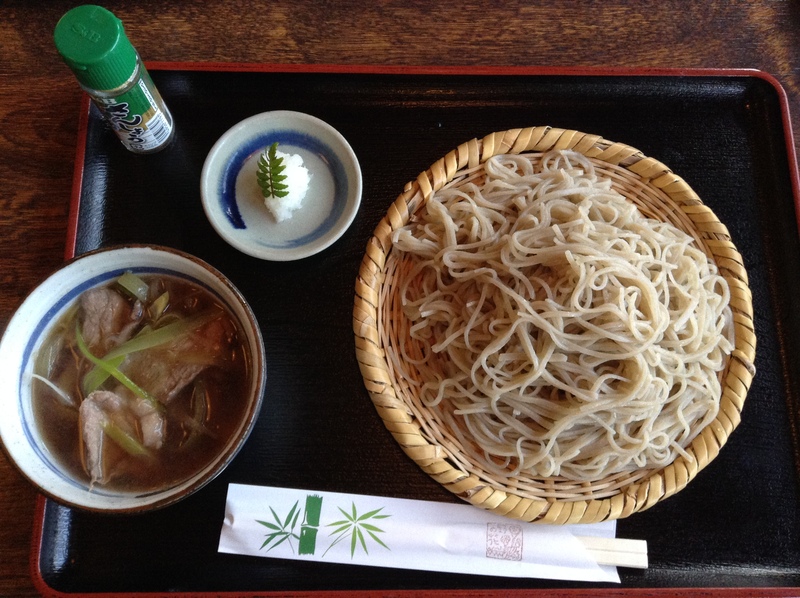 The soba (buckwheat) comes from Nagano, Ibaraki, and Hokkaido. The buckwheat is milled at the shop and the noodles are made in house. The noodles had a little bit of a bite to them, which I really enjoyed. The tsuyu is made with kombu, katsuobushi, and donko dried shiitake mushrooms. The soy sauce is Okubo soy sauce from Matsumoto in Nagano. The shop is open from 11 a.m. to 3 p.m., but will close early if they run out of soba. To get to it you do need a car or by taxi, ten minutes from Akashina station in Azumino city, Nagano. 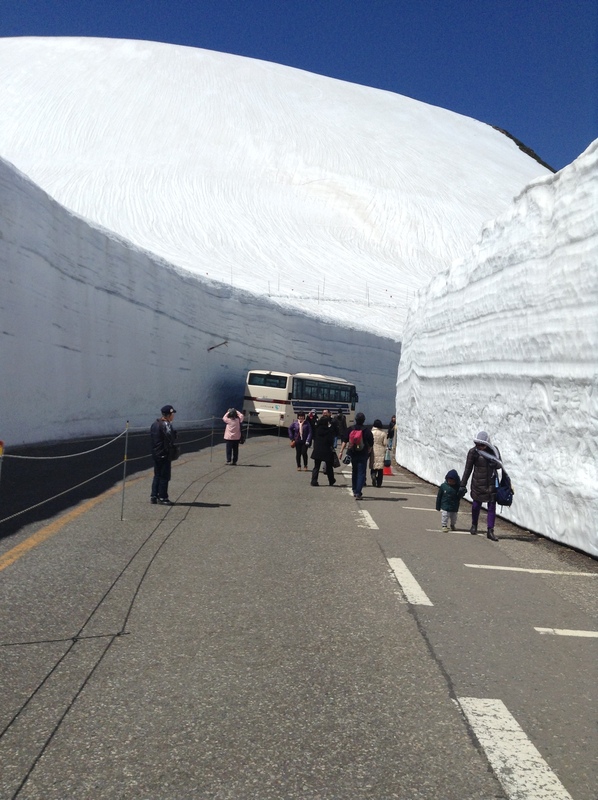 We visited Okina after a trip to the Tateyama Kurobe Alpine Route. I have always been fascinated with the snow canyons of the Kita Alps (North Alps) between Nagano and Toyama prefectures, also near Gifu. We were in Ohmachi, Nagano to help a friend plant a vineyard for wine so jumped at the chance to visit the famous Alpine Route. 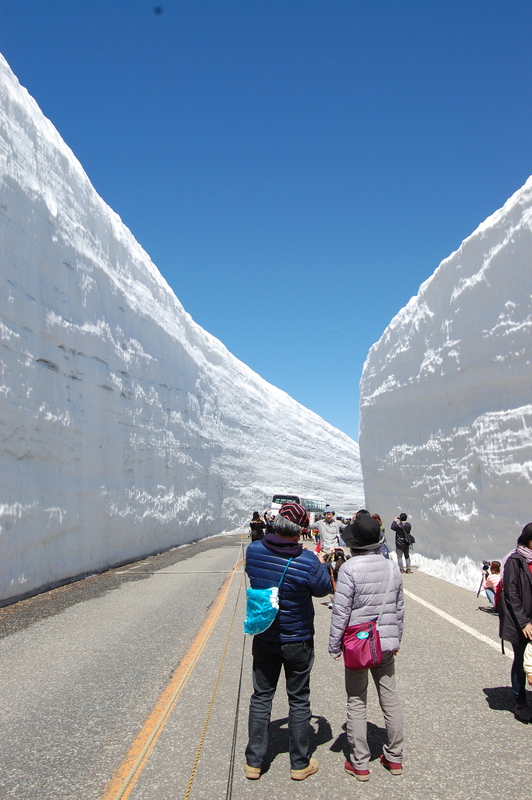 The snow canyons only open to the public from mid-April It can be accessed from Ohmachi in Nagano or from Tateyama in Fukui. We started our journey at 8:30 a.m. and it took a combination of electric buses, cable car, and a ropeway to get to the top of the mountain. We finally arrived at 11:00 a.m. to Murodo. From here visitors can walk into the snow canyons. It was even more impressive than I imagined.